Over the next 20 years, most low-income countries will, for the first time, become more urban than rural. Understanding demographic trends in the cities of the developing world is critical to those countries - their societies, economies, and environments. The benefits from urbanization cannot be overlooked, but the speed and sheer scale of this transformation presents many challenges. 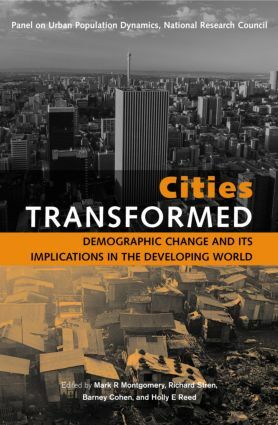 In this uniquely thorough and authoritative volume, 16 of the world's leading scholars on urban population and development have worked together to produce the most comprehensive and detailed analysis of the changes taking place in cities and their implications and impacts. They focus on population dynamics, social and economic differentiation, fertility and reproductive health, mortality and morbidity, labor force, and urban governance. As many national governments decentralize and devolve their functions, the nature of urban management and governance is undergoing fundamental transformation, with programs in poverty alleviation, health, education, and public services increasingly being deposited in the hands of untested municipal and regional governments. Cities Transformed identifies a new class of policy maker emerging to take up the growing responsibilities. Drawing from a wide variety of data sources, many of them previously inaccessible, this essential text will become the benchmark for all involved in city-level research, policy, planning, and investment decisions. The National Research Council is a private, non-profit institution based in Washington, DC, providing services to the US government, the public, and the scientific and engineering communities. The editors are members of the Council's Panel on Urban Population Dynamics. MORTALITY AND MORBIDITY: IS CITY LIFE GOOD FOR YOUR HEALTH?